Can I apply RTI to Punjab Public Service Commission (PPSC) to get a copy of my answer sheet ? Can I file RTI to Cantonment Board ? Can I file RTI to Controller of Defence Accounts (CGDA) ? Can I file RTI to know procedure for changing the property tax paid for commercial purpose to residential ? Can I file RTI to get a copy of Annexure K from EPF Office? I want to know the eligibility criteria for Rashtriya Krishi Vikas Yojana. 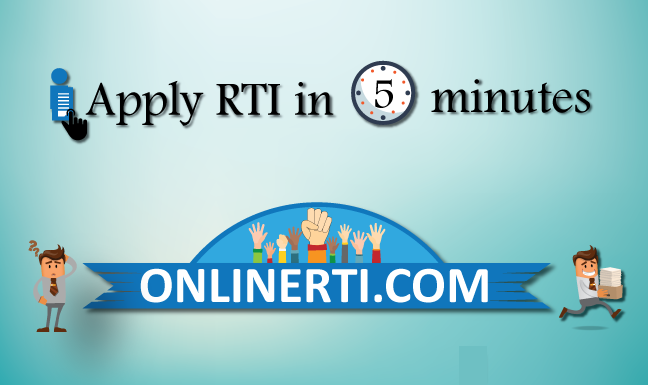 Can apply RTI ? Can file RTI to know the eligibility criteria for Beti Bachao, Beti Padhao Yojana ? I have not received home loan subsidy amount from State Bank of India. Can I apply RTI to know the reason ? My name is not in the voting list for Lok Sabha Elections 2019. I want to know the reason. Can I file RTI ? Can I file RTI for forensic report ? Can I file RTI to get File Notings of my complaint ? Two mobile towers were installed in our locality last month. I want to know its legality. Can I apply RTI ? Can I apply RTI to Punjab National Bank (PNB) ? I have appeared for Karnataka 2nd PUC Examination 2019. I want to see my answer copy. Can I apply RTI ? Can I apply RTI to Border Security Force (BSF) ? What is the provision regarding Compensation‘ under the RTI Act, 2005‘? I want to know whether I am eligible for Below Poverty Line (BPL) card. Can I apply RTI ? Can I apply RTI to get Intimation of transfer by Transferee (TCA) from RTO Pune ? Can I apply RTI for Intimation of transfer by Transferor (TCR) from RTO's in Gujrat ? Can I apply RTI to get daily cause list from court ? Can we get judgement and order copies in any court records ? Can I file RTI for revaluation of Exam Paper? Can I apply RTI to Maharashtra Pollution Control Board ? Can we get documents related to property , address and ID proofs of the parties which are produced in the court ? Can we get 161 statements of a civil suit (pending and disposed both ) ? Can I apply RTI to know the eligibility criteria for Pradhan Mantri Mudra Yojana ? Can I apply RTI to know the eligibility criteria for Pradhan Mantri Suraksha Bima Yojana ? I want to know about the funds allocated for Rajiv Awas Yojana. Can I apply RTI ? I want to know about the funds allocated for Pradhan Mantri Jan Dhan Yojana. Can I apply RTI ?